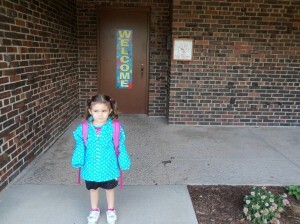 Cardin started preschool today. The statement itself is so powerful to me, it alone can trigger a minor anxiety attack. How am I old enough to have a kid in school?? Didn’t we just bring her home from the hospital? I realize she’s turning four in November and she very well could have gone last year, but there is a part of me that still see’s the baby bundle I brought home from the hospital. 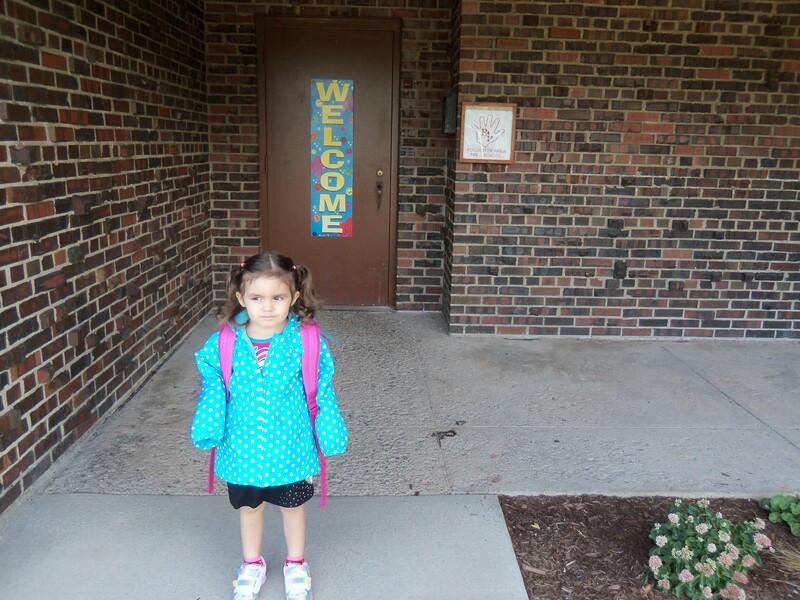 In the months leading up to this change we prepared her with visits to the school, many talks about her new days, and her own book bag and new sneakers. She woke this morning, very excited to start this next chapter in her life. I was fearful of this transition for her, though i was very careful never to express my concerns to her She has been through so much change this year already. With the pregnancy, the arrival of Rory, and now my hospitalization and surgery. Add to this the idea that she has never stayed with a stranger, outside of a family member. This is the first time we’ll be entrusting her safety to another person that is not blood related. To say I was apprehensive was putting it mildly. She was dressed to the nines in her hello kitty outfit; donning a full set of pink nails. She had on her light up princess sneakers and her Minnie mouse back pack. By 8 am she was asking if it was time to go and mommy didn’t even have a bra on yet! 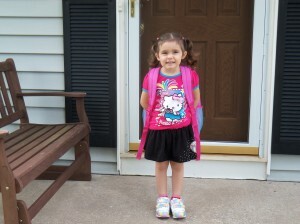 We arrived at preschool in time to take the obligatory “first day of preschool pictures”. As we crossed the threshold, her tiny fingers slipped into my hand and I gave her a reassuring squeeze as I felt the lump start in the back of my throat. We hung her coat and put away her back pack. Listen lady, I knelt down and hugged my baby; fighting back a deluge of tears. I kissed her, told her I loved her, and promised I’d be back to pick her up before she knew it. Before my emotions could get the better of me, I stood up and passed the hug onto Brett. With some hesitation, Cardin took the teachers hand and went into the classroom to play and I watched my baby transform into a little kid. I contained the swell of tears until we had left the building. As much as I wanted to spend the hour sitting in the parking lot or peeping into the classroom windows, I forced myself to drive away. The next hour ticked by at a snails pace. Since this was the first class, the kids were being split up and only attending for an hour, instead of the normal 2.5 hours; to help with the transition. When it was finally time to return to preschool, I couldn’t wait to grab her in my arms and ask her 1000 questions. And it’d only been an hour!!!! She ran right for me with the biggest of hugs and spent the remainder of the day making sure I was at least within earshot if not within sight. I’ve no doubt she’ll do awesome. I’m sure it will take a couple weeks to get used to the new schedule, but I can’t wait to watch her grow over this next year.